The next night I woke up at 1:00 A.M., I smiled to myself. Now was my opportunity to put positive thinking into practice. I decided that if I was awake, it must be for a reason. I did have a problem on my mind, so my first action was to get pen and paper and write down the problem, and any solutions to it I could think of. Next, I said to myself that no matter how much or how little sleep I got that night, it would be enough, and I would feel rested, alert, and full of energy in the morning. Perhaps I had been telling myself that I needed eight hours of sleep when my body didn’t really need that much. My body would just have to be in charge—if I slept, it would be because I needed sleep, and if I didn’t sleep, it would be because I had gotten all the sleep I needed. I picked up a book and read until I got sleepy, turned out the light and went back to sleep. In the morning, I awoke feeling great. I don’t remember how many actual hours of sleep I got that night, but I have found that it doesn’t matter as much as my attitude about it does. Sometimes I get eight hours of sleep and feel great, and sometimes I get only four hours of sleep—but I still feel great! By thinking that whatever amount of sleep I get is enough and that I will feel rested and energetic in the morning, I am not anxious about getting the “right” number of hours. Anxiety won’t make you money, and anxiety won’t make you sleep. Sleeplessness is your opportunity to practice peace, serenity, trust, and calm. Then you can transfer those qualities to your waking hours—and your money-making hours. For more than 25 years, I have been helping small business owners make huge leaps in their income and enjoy fabulous success and prosperity. A new business owner who designed fashion accessories went from $5,000 to $100,000 in one year after taking this course. An auto broker who said December was notoriously bad for car sales had the biggest month of his career in…you guessed it – December! A closet designer went from low six figures to high six figures in 1 1/2 years. If this is the kind of growth you’d like to see in your business, or if you’d like to get the raises, bonuses, and promotions you want in your job, this course is for you. 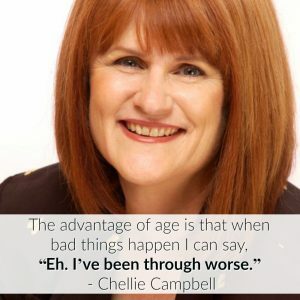 Click here for details of the course http://www.chellie.com/financial-stress-reduction-telecourse-information/ then call Chellie for your discount coupon at 310-476-1622. I’d love to help you achieve the next level of success you want, too!